Instructor-led trainings are too rigid for today’s dynamic corporate world. The idea of taking a learning course at a specified time and place doesn’t sit well with today’s fast moving millennial employees, as trainings once missed, cannot be accessed again. But, what if you already have instructor-led training material, on which you have spent considerable time and money for development? Convert your ILT to an e-learning course to get the most out of the knowledge you have already compiled and the cost you have already incurred. 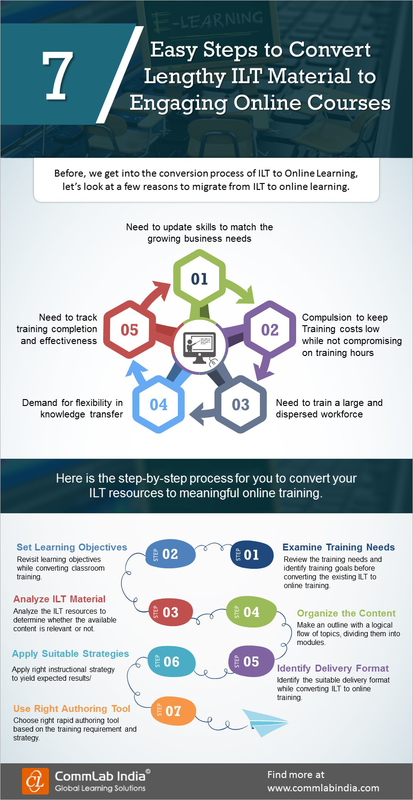 Check out this infographic for 7 simple steps to convert your lengthy ILT material into engaging online courses.